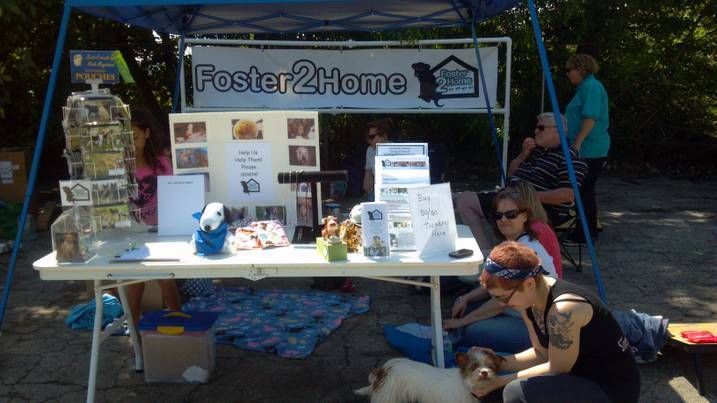 Outfit skaters recently had an opportunity to help out at Puppy Tail-Gating. U.S Bones and the Dog Saving Network hosted their inaugural “tail-gaiting” party down the street from Cellular One Field, as the White Sox were hosting their Dog Day Game. There were lots of dogs there, and many up for adoption. Sneer and Loathing, Lady K, Trouble Chicken, Dianasaurus Ross, Brawly Shore, and I ran fun carnival games where tail-gaters could win prizes for their pups. A few of us had the opportunity to judge a dog costume contest and a dog trick contest. Sneer and I completely fell in love with Maximus, a tiny little pit bull puppy. He placed in the costume contest, but didn’t win. We figured he had many more years ahead of him and he’d be winning future contests solely based on cuteness. But who did win the costume contest? Lady, the pug, one of the pups up for adoption. She may have broken the rules because she was not in baseball-themed wear, but who could resist that face? There were also plenty of food trucks- one with donuts [it smelt like fresh donuts all day], another with tons of different kinds of skewers, and a gourmet pet treat truck. There were lots of prizes and other fun stuff for dogs and their owners to enjoy. Despite the heat and the fact that we all wore our black Outfit gear, spending time with all the dogs was so much fun. Hope we can do it again next time!